Bouvier des Flanders are an imposing breed with a heavily-coated head. They have both a beard and a moustache and shaggy eyebrows. Bouviers have a rough shaggy coat that is harsh to the touch but protects them from the elements. Bouvier des Flanders may be various shades from black to fawn to gray to brindle. 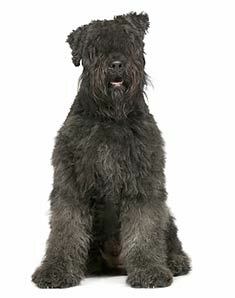 Rugged and wiry, the Bouvier des Flanders has a harsh coat which is well suited to various climatic conditions including the cold and the rain. Bouviers require regular brushings and must be trimmed three times a year. A well groomed Bouvier des Flanders sheds very little. The intelligent and obedient Bouvier des Flanders looks mean but in reality is calm and gentle. They are excellent at learning and once they learn a command they will remember it their entire lives. Bouvier des Flanders are famous for their loyalty. They require an experienced handler and are often protective of their families. Bouviers do not reach adulthood until they are 2-3 years old. Although prone to hip dysplasia and bloat, the Bouvier des Flanders is generally a healthy breed. 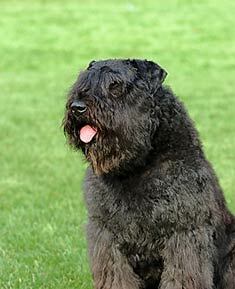 The Bouvier des Flanders can be expected to live about 10-12 years. Bouviers require lots of exercise and running spaces and are therefore best suited for suburban or country life. Find Bouvier des Flanders Puppies with our Free Breeder search!